History of "The Austin Eight Register"
Click on the image for some more in Colour. 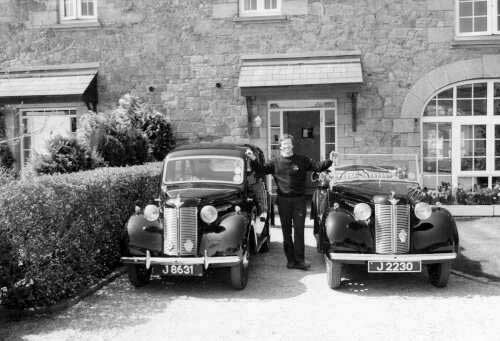 The history of the Austin Eight Register started by Ian Pinniger in 1974 when he bought his first Austin Eight Saloon. Ian just was wondering how many Austin Eight's were still in existance. In 1993 Ian published a book "The Austin Eight". This book contained the Austin Eights found till then. New un-read copies of ths book are still available via the web store of the Austin Eight Register web page. Autumn 2012 I bought Ian Pinniger's 1939 Austin Eight Tourer, called DOT and from then I also took over the complete Austin Eight Register, including all Austin Eight historical documents and automobilia. I am very gratefull to Ian who has given me the thrust in building further what he has started. Also I am gratefull to all Austin Eight owners and enthusiats assiting me to build the register further. I will continue what Ian Pinniger started in 1974. Funny thing is that my interest in The Austin Eight started exacly the same as Ian's in 1974. After I bought our first 1939 Austin Eight two door four light saloon, called "Aussie" in 2010, I had difficulties to find spares and was interested in how many Austin Eight's were still in existance, because so less information was available. After I had obtained a copy of Ian's book: "The Austin Eight" I have searched for Ian and found him living in Jersey. After some contacts with him during a few months on a distance only, we seemed to have a "click" and Ian proposed me to take over The Austin Eight register together with his lovely 1939 Austin Eight Tourer. This was the starting point for me to build the Austin Eight Register further. Ian handed over to me the Austin Eight Register containing about 225 registered cars. Now the register has already grown over 600 registered cars. I have to say that the job for me is much easier because of nowadays Internet and E-mail systems, which were not available during the time Ian started to build the register. 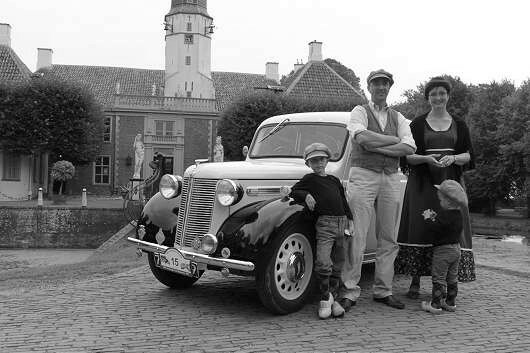 I have to thank my wife Tineke and my sons Tim and Hugo, for putting up all hours spent building the registers and giving me the opportunity to enjoy our Austin Eights with all our family. I hope it will bring them good memories in the future to come. May be I am able to assist you finding, the Austin Eight you ones owned, history about your Eight or finding other persons with an Eight in your area. If you own an Austin Eight please assist me in building the register further by sending me the details of your car. If you need another format, please let me know. After sending your detailed information about your Eight, I will check if your Eight is in the register and of course I will send you the history of your car as mentioned in the register. I look forward to be of your assiatance. The Acknowledgements below are taken from the book "The Austin Eight" by Ian Pinniger in 1993. 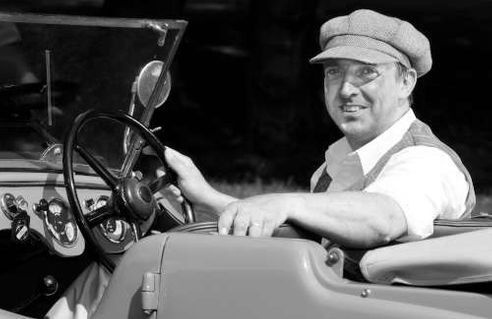 I took over the Austin Eight Register from Ian in 2012, together with his 1939 Austin Eight Tourer, called DOT. A copy of this book is still available in the Austin Eight Register web store. "There are very many people to whom I own a debt of gratitude. The creation of this book came about as the result of wondering just how many Austin Eight's existed, there being no club, no spare part service or book dedicated to the Austin Eight. 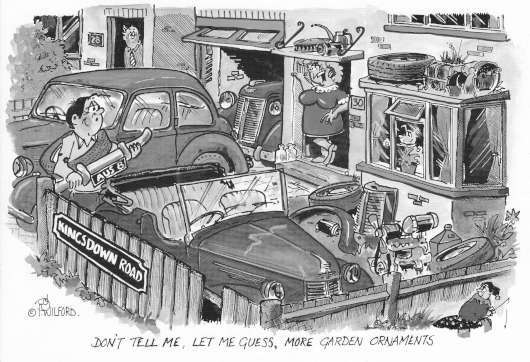 I bought my Austin Eight in January 1974 and had great difficulty obtaining spare parts. In those early days Derek Roberts from Gloucester used to help me out and we have become good friends. I have the pleasure of a reunion each year at the Beaulieu auto jumble. To start the register off I used a letter typed in the office. photocopied, together with an Austin Ten drivers club members list to locate those Austin Eight owners. (I was a member) I thought there were only about 30 Austin Eights in existence. Having sent the letters off, Tony Phillips-Smith telephoned one Sunday afternoon, introduced himself, stating that he owned more Eights than anyone else, 3 at that time, and put a bet on with me that there were about 90 in existence. We were both wrong! Tony has been very supportive, and has drawn Austin Eight Christmas cards for the Austin Eight Register several years, so many thanks to you Tony and your wife Jane. Before the register could be put together, I needed a computer program set up to keep all the file records. I am certain that I could not have accomplished anything without the help and patience of Steward Hill, a computer expert. Not only did Steward set up the program, but helped me through this early stages when I knew absolutely nothing about computers. Now I am quite comfortable with the lap-top Steward recommended. The last few years I have seen the register grow and develop into quite a club. 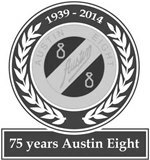 As I write I have just ordered our Austin Eight register car badge. I have made many contacts and met almost all owners in the United Kingdom and quite a few that live overseas. As I write 210 records are maintained and I have build a world wide network of Austin Eight owners. It has given me considerable satisfaction seeing follow owners getting in contact with each other, exchanging parts and advice and being able to resolve their problems. To my mind that's Austineering. I must thank Tim Braby in Australia for his support and the loan of the Wasp photographs. Two other owners that I particularly thank are Idris Hassan, from Malaysia, for his superb photographs, several make up the colour plates and Dr. Tito Cabral de Norohna, from Portugal, for the Photographs that I have used for the cover of the book. In the UK and Jersey we owe a depth of gratitude to John Buckley who has been so kind and helpful. Barry de la Mare who let me have some Austin articles. Also Roy Walker for thrusting me with his rare magazines. Derek Hammond who is now manufacturing parts. And really it is all to you recorded in the register that I must thank for participating, allowing me for both record your cars and the fascinating history associated with each and every one. I also acknowledge with grateful thanks to the publishers, who have allowed me to compile and use articles for this book. Last of all, but not least, I must thank my wife, Jill and my three daughters Joan, Anne and Rachel for putting up with the long hours spent building the register I hope those who obtain a copy of "The Austin Eight" enjoy what it has to offer". Derek Hammond "Mr. Austin Eight"
During several contacts with Austin Eight owners, one name comes to the front over and over again. Derek Hammond was mentioned to be Mr. Austin Eight. Derek remanufactured parts for Eight's to assist owners to rebuild their cars. From al I hear Derek was a very well respected person. He was offering his spares for example at the Beaulieu auto jumble. Unfortunately Derek past away and I was unfortunately not in the position to meet him personaly. This is why I have decided just to mention his name related to the Austin Eight Register. 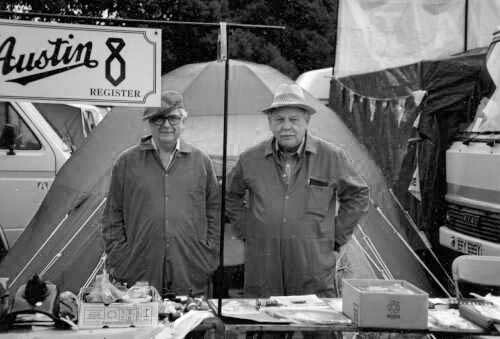 Derek Hammond and Ian Pinniger were close friends as well and Derek and Ian were the Austin Eight Register in the early days. The parts were sold to the ACCC by Derek's wife, some time after Derek past away. From what is left of these, Austin Eight's are still provided with parts from good old Derrek through the ACCC. "I am the owner of an Austin 8AP tourer which I have restored myself from a real mess which I towed home with all the bits and pieces stowed in the back. The comment of my wife was: "- What the hell is that thing ? You have passed two scrapyards to get it here!-" That was in 1975. I spend six years of part-time labour getting the vehicle back into its present condition and it was back on the road in 1982. I have had a lot of fun with it since and won a few "pots" etc. plus a great deal of interest from people of my age who remember the war years." 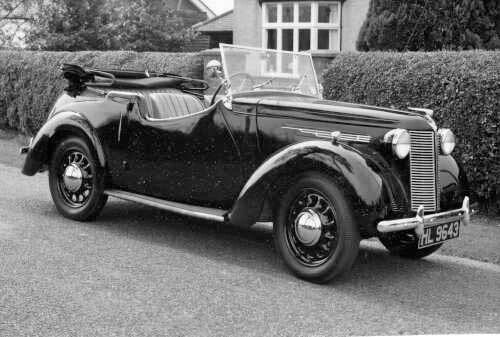 The car of Derek Hammond after he brought her back to life again, she is a nice example of a 1939 civilian 8 AP tourer. The current owner is unknown to the register, but the car is still purring arround and is spotted on classic car events. 700 cars registered of which 645 in existence. 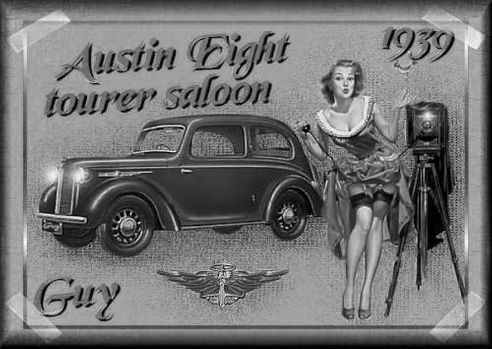 Austin Eight site members are able to view more information about the register, by clicking on the image below.